A zingy idea gets your attention. Ideas like that have voltage, energy, life. They have the energy to make you different. They have the power to change your mind, your imagination, even your actions. They have the oomph to change your company or your industry. A good idea is relevant to your life. It resonates with you . . . and yet it's different enough that it didn't occur to you before. No matter what the idea or innovation, if it's great enough to change you, it has that magic combination of relevance and difference. I've sat through too many meetings where the people in charge approved the idea that made sense rather than the idea that got a reaction from the room. In meeting rooms all over America right now, managers are arguing for the 'make sense' ideas rather than the ideas with a spark of energy. In fact, the truth is that the worst idea is the one that makes sense. If you're not excited and energized by your idea, what consumer is going to be? This is another instance of the left brain (logic) triumphing over the right brain (intuition). The majority of us live in our left brain. We've been trained to be logical people. Obviously, there's value in logic-at the right time. When it comes to innovation, the role of logic is to sort and strategize rather than to generate. Ideas that don't elicit a reaction in a meeting room are unlikely to generate a reaction in the marketplace. Reason has a role in the innovation process; it's just not operative at the beginning. 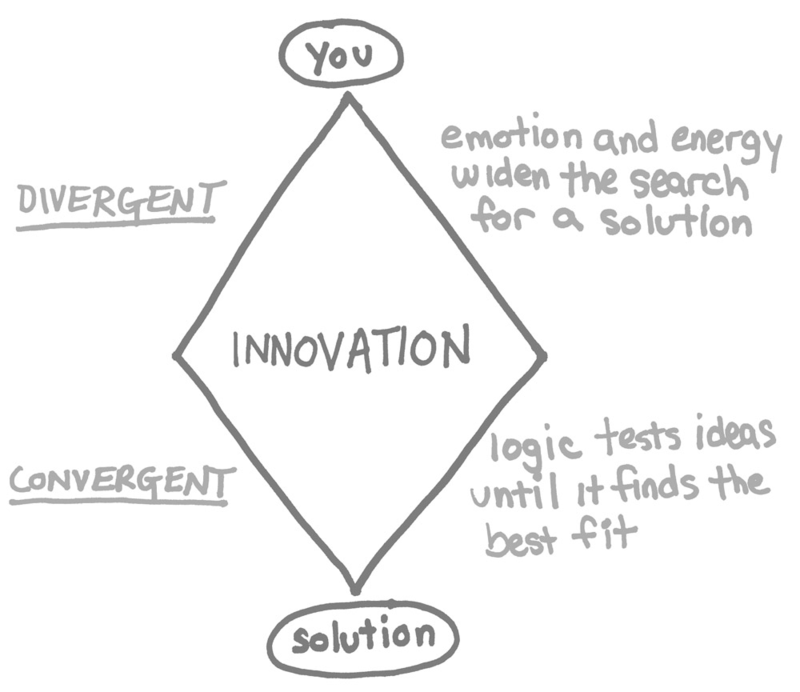 John Kao and Dorothy Leonard at Harvard Business School teach that the process of innovation can be thought of as a diamond shape: It has a divergent and a convergent side. The divergent top of the process is driven by emotion and energy (right-brain qualities); the convergent part of the process is driven more by logic, as the left brain comes back into play. Many of my clients are much more comfortable in the convergent part of the process than in the divergent part. The divergent part can feel uncomfortable, and that's OK. Just stay there for an hour or a day longer than you're used to, and you may be amazed at what creative genius steps forward. We need to let our logical minds take a rest on the hammock for a little while we're working early on (just as I've asked you to do with the exercises in this resource). When we let go of logic for a moment, we can be open to ideas that might not 'make sense,' but that get a reaction. We've all been in meetings where people react strongly to something-perhaps with a laugh, an inadvertent 'mmm . . . ,' scorn, anger, the hair on the back of the neck going up. Usually those ideas are the ones that get discarded and discounted. Those are the ideas with energy. They've elicited a reaction. Some nugget in that comment may have the potential to elicit a reaction in the marketplace as well. Do you always want to run with the raw 'mmm . . . ' idea? Of course not. This is where our logical minds help us out. We can take the basic, unfiltered ideas that emerge during the divergent phase of thinking and use our logical minds to shape them and mold them. Energy is important. You can find energy by looking for paradox, conflict, and friction. When you find those 'hot spots,' you know that you've found a source of energy. That's fertile territory in which to start drilling, exploring, and generating ideas. All of the innovations that have had the power to change my life have in some way given me a fresh way to resolve a paradox I'd been living with. For example, when I was a single parent I wanted to hire other people to do as much stuff for me as possible. Who has the time or the energy for an expedition to the grocery store multiple times per week? Yet my kids are picky, and I too am fussy. I want it done my way. Then Peapod introduced an online grocery shopping and delivery service that was personalized to my needs. I could order all my groceries - and specify that I wanted bananas that were really ripe - and the next day they were delivered to my third-floor walk-up condo. Everything was just the way I wanted it, yet I didn't have to do it myself. Peapod is a great resolution of conflicting desires. We'll use various examples throughout this resource, but we don't necessarily believe in studying case histories in minute detail. That path leads to my fledgling 'this is the way everyone else has done it' floor wax presentation. Everywhere in our culture-in the marketplace, on television, in the movies-you can see examples of imitation substituting for innovation. Carefully putting your feet into someone else's footsteps is not the same as learning how to walk. Instead, we're going to look beneath the surface, at the process of thinking creatively-and at the ways in which we often stop ourselves from thinking this way. This resource will help you have ideas that work because they grip people. The opportunities for having ideas that work are all around us every day. They come out of the stuff of life; they don't come from mad scientists with test tubes shut up in labs all day long. We all have situations that we accept with a shrug and a feeling that 'that's just the way life is.' These are the situations in which we can choose to complain or to create. They are fertile territory for powerful ideas.